Why I choose engineering as my post? Well, it’s because I’m not quite expose to it and many girls thought engineering is kinda boring and just working with machines. They are totally wrong! A lot of boys will choose engineering because of their interests and incomes. Malaysia is developing and no doubt that our country needs a lot of engineers in future. Okay, let me intro about some common engineering courses. If you are good in your maths and science subjects (especially physics), are inquisitive by nature and have a strong interest in invention, engineering is the course you should consider taking up. There are many types of engineering but the basic principle of all engineering disciplines lies in using scientific knowledge to improve quality of life through inventions. Depending on which engineering discipline you choose, you could be inventing new technologies and processes, products and services, or improving existing ones. If you have always been fascinated by how a large craft can become airborne, you might be interested in this field. Aeronautical engineering is all about making things fly. You will plan, design and test aircraft, missiles and spacecraft. With your knowledge, you design everything from wings to cockpit controls to create the safest and most efficient vehicles possible. Qualifications of this course are wider compare to the other courses. You can apply for this engineering if you have diploma in mechanical engineering or electrical engineering. Not to forget, you must be a good team player too! A Pratt and Whitney turbofan engine is tested at Robins Air Force Base, Georgia, USA. Image by Wikipedia. This is a relatively a new course that aim to find new ways of tackling medical conditions more effectively and efficiently. Not only will you learn engineering aspects in the course, you would also learn about human anatomy and computational modeling. This is because biomedical engineers have to define a medical problem and find a solution that satisfies both engineering and medical requirements. You will basically learn to design and develop tools to solve problems in medicine and life sciences. The course is not limited to just one type of engineering but also integrates theories from various engineering disciplines like mechanical, chemical, computer and materials. Chemical engineering involves the design and operation of processes that turn raw materials like fuel, food and plastics into useful products. Besides chemistry, you’ll be studying a lot of physics and math in the course too! Chemistry studies involve study of changes in the composition and the nature of matter and its properties; while the physics component involves studying the forces that act on matter and the maths component studies the mathematical relationship between matter and its forces. At the end of the course, you should be competent in developing, designing, operating and controlling processes (both machinery and devices). You also will learn about safety and environment issues because chemical engineers are responsible for designs that are economically viable, safe and not harmful to the environment. A student makes light-sensitive molecules. Photo by believekevin. Many Malaysia students are interest in this course. This course is concerned about planning and building of infrastructure such as roads, bridges, buildings, reservoirs and transmission towers. The course will teach you about physical and chemical properties of building materials and how they react under pressure or weight. You will analyze structure systems, including beams, frames and steel elements. Civil engineering is broad discipline so you will usually specialize at the end of the course. Some of the specializations that you can choose from are structure, geotechnical, traffic and highway, environmental, and hydrology and water recourse systems. By the way, you must be practical and creative at the same time! Langkawi bridge. Photo by peter.macdonald. Electronic circuit. Photo by Storm Crypt. This is one of the top courses when students are applying for engineering. Electronic engineering is closely related to electrical engineering but while electrical engineering deals more with large-power applications, electronic engineering is concerned with lower-powered electrical systems. An electronic engineering course will give you a thorough understanding of analogue and digital electronics and microprocessor hardware and software. Electrical engineering is concerned with different forms of electrical charge, how they behave and how they can adapted for use. You will study about transformers, complex network functions, electrons, magnetic field and electric fields, and basic electrical measurement devices such as ammeters, voltmeters and oscilloscopes. This specialized course is concerned with study of materials that underpins most of the technology we depend on. In this course, you will learn all types of materials such as ceramics, glasses, metals, polymers, semiconductors and biomaterials. The course will also give you the opportunity to study the behavior of materials under different conditions, analyze the selection of appropriate materials for a given application, and develop new materials and methods to process them into useful objects through research and practical experiments, among other things. You will need a good IT and analytical skills for this course. If working with around machines simply fascinates you, you’ll enjoy this course. In the first 2 years of the course, you’ll study core subjects like thermodynamics, fluid mechanics, solid mechanics and dynamics. Besides that, you’ll also study about mechanical behavior of materials, electrical circuits and computer-aided design, computer-controlled systems and mechatronics. The scope of mechanical engineering is very broad, so you can opt to specialize at the end of the course. Telecommunication engineering is quite similar to electrical and electronics engineering. It brings together elements of electrical and electronics, and computer engineering. The course will cover typical signals (speech, audio, video, and data) and their characteristics as well as key techniques in handling transmission system issues (modulation, coding, multiplexing). You will also learn to evaluate system performance. You will develop skills in electrical circuits and electronics (analogue and digital), modeling and simulation of systems, applications of electromagnetism, optical fibers and communication, photonics, data networks and satellite communications. 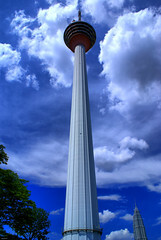 Menara Kuala Lumpur is the fifth tallest telecommunication tower in the world. Photo by eshare. Nice write-up to sum up some of the engineering courses. Heard of sound engineering? Heh, I'm considering taking this course. Unlike it's physics & maths-based engineering counterparts, sound-engineering doesn't seems to need all these science and maths qualification, as what I read. Sound engineering? Yup, I heard it before but not quite sure which uni offers it. But i know that diploma in INFORMATION ENGINEERING acts as basic which leads to the degree. And one more, mechatronics engineering. Anyone heard about it? This post really caught my attention as I'm now studying Physics in lower 6.So, thanks for providing this info!! fch,mechatronics engineering is also known as electro-mechanical engineering. Mechatronics engineering is a unique combination of engineering, electronics,control and intelligent computing.Some of the core modules that you will learn in the course include development and intergration of intelligent sensors, actuators,micro-systems,advanced decision-making and control strategies. The course will prepare you to work with various mechatronics systems such as industrial robots,manufacturing lines,automation,cars,computer-controlled machine tools,electric typewriters and mobile phones among others. You will need prior study of physics and mathematics (and in some cases a second science subject such as chemistry). Hehey! I studied mechatronic engineering! Yup, mechatronic is a all about control and system integration. Its all about making devices work together, and how to control them more effectively. i) If you want to be a Professional Engineer in Malaysia, I would check with the Board of Engineers Malaysia to ensure that your course is accredited. ii) What do you want as a career? If it's an engineering field, you might find that you have a wide choice of disciplines. For example, I work in the oil & gas industry, and have a ChemEng degree, but I see the whole gamut of eng disciplines working around me. If your career is not eng, then choose a course that might be more general, with options for finance, creative arts and the like. Have fun, all you young 'uns. engineering is a WIDE, terribly wide field of study. what you have touched on here are the courses which are often discussed and chosen by students. i believe you could have done a little bit more homework and talked about the other engineering courses which is facing a worldwide shortage. there are many professional level engineering professions (which means you hold a professional certificate, renewable) which also reward you heftily. some who are so dependent on whether their qualifications are recognised by the BEM haven't really seen the world on the other side. i hope to see better coverage of a subject in the near future, and not the same usual stuff i can find via google. I think most malaysia-student prefer to chose civil and electrical engg, it is because the goverment only send and offer this engg courses as the main. If the student choose earospace or nanotech engg , I think there is no job for them at Malaysia!!! i would like to ask do you have any recommended college or university in malaysia for engineering course? mechatronics, telecommunication and electronic are my interest.. thanks! Is tat the financial engineering relate with course of engineering...? hey, u should give more information about marine engineer. It is one of the in demand career but not widely expose among malaysian. Great article by the way! hi this is a very good post anyway! can i ask about genetic engineering? where can i study it in Malaysia?? im a SPM leaver. thanks! Hey, great article. Petronas offers several engineering fields in its scholarsips and I was confused then because of the lack of exposure. But I eventually chose chemical engineering cuz I hink I would relly enjoy working wth chemicals...Electrical engineering seems to be the toughest among all, at least that's what my uncle said. But it also offers the widest opportunities...everything is electronic now! emm.. can you tell me more about mechatronic engineering..
i still blur about me.. hu3.. help me..
can you tell me.. what job can i handle for the future if i take mechatronic engineering corse.. pliz.. help mee..
i am going to futher my study in mechanical engineering course soon. but my problem is that i don't really know about this course, because that is my father suggestion. does the course still in the gouverment demand list? i hope someone can help me regarding my ploblem. thank you very much. hey guys, how bout audio engineering?? hi...can u tell me bout power engineering and the demand of power engineering in this era?? hey.great post by the way.im interested in doing telecommunication or chemical engg because i enjoy learning chemistry.but my father prefer me to take mechatronic engg because he said that chemical engg is way hard.really? I am not studying civil engineering as of now, i am doing BBA-IT course, but other than that I go to my father's site everyday and learn stuff practically. I am thinking of joining some college if they have a semester from january. Can you help me out with the choice of colleges? Hi, i would like to pursue my study in aerospace engineering. I want to know more about civil engineering..
no body guide me and i just finish my SPM waiting for my result... i don't know what course should i take... i only know that engineering is my best choise cause i love to do things related to hand... However there are so many course in engineering... which are the course that relate more to hand? I hope you read this one..
You should start read a lot too! hello..umm i'm now currently in form 4 ..n i wanna be aerospace engineer..but the course that i take is science technical..that got physic,chemist n it subject..(i don't have biology subject)..n the thing that i wanna know is biology subject needed to be aerospace engineer?.. i receive an offer to study diploma in Maritime Technology engineering at RANACO(RETI),Terengganu.is that a good course? i'm regret about that course..can i be a marine engineer? did you know what are the subjects that i must take during the programme? hello everyone...i am really intrested in chemical engineering and right now still study in matriculation college....and i doest know whether in this field would promise me a job in future....can you help me on that?? is there bright future 4 malaysia's mechtronics degree holder?? to take engineering course for my career path.Help me to choose and is it ok to start with certificate level? 1). Mechanical/Aerospace engineering degree allows you to work as Design/Stress/Weight/Structure/Manufacture engineer in any aerospace structure/mechanical field or can also work as Aerodynamist. 2). Electrical engineering degree allows you to work as aerospace engineer who focus on avionics. 3). Computer engineering degree allows you to work as aerospace system engineer. I give you another example of myself. I graduate with double major in Aerospace and Mechanical degrees, and I have been working as Aerospace Design & Weight engineer for aerospace structural project since 5 years ago. Good luck and hope it gives you some idea of how to develop your career path and seek your dream. Just wanted to add a few points on Chemical engineering from my limited experience. Studying Chem Eng as a traditional engineering subject, you would expect to do things like fluid mechanics and thermodynamics (physics-type subjects). Emphasis is always on material and energy flows - whatever comes into your process needs to go somewhere. Only small amounts of chemistry is involved, esp organic chem and analytical chem. Later on, design becomes a core subject, just like how design would be for other eng courses. Things like process control and some economics are involved later on as well. From what i've discovered, getting a relevant degree helps you get a job but it does not guarantee it. It is more important that as a person you have good qualities and enjoy what you're doing. I recommend doing something that you like, and never think that just because you have a degree in something popular/in demand, you're guaranteed to be sucessful. im totally lost about this course n i know this course very tough indeed...so i hope u can give me sort of info about this course n where is the common u in malaysia that offer this course??? is biomedical ,chemical and environmental engineering related in any way? im kinda confused on choosing a field to study. is biomedical engineer a good career in malaysia and can we work in oil companies? i am interested in the subjects related to biology and chemistry.I kinda interest in doing biomedical engineering.Since i am not that interested in physics and electronic handling career would biomedical engineering suits me? help me,chemical engineering or mechanical? my MARA's interview is coming soon. it is true that nowadays people are looking for mechanical engineer rather than chemical engineer? hey, im Nick, ive always had intrest in CIVIL engineering, and currently im preety lost as my SPM results are preety bad.. only have 3 credits and sadly no credit in maths..i heard that i still can do Civil by sitting the Certificate program, how do i do so? where do they offer this certificate program? I worked as a mechanical, in malaysia salary is lower than other countries, but even so I intend to continue studies in engineering, with experience and passion I have, intend to succeed in the field of mechanical engineering, in malaysia public student who is successful in this field but the experience is not there to make people who work away from the field of education ..
hey nice write up but have you guys ever heard of MARINE ENGINEERING? i have a Diploma in it. It deals with Running,maintanance,Design and control of engines onboard a ship.basically most ships use Diesel powered engines or the Two Strokes Engine! hello im a girl,,had been offered electronic engineering in wireless comunication which i need to continue my studies at UTEM...but im not soo sure either wanna take that course or not,,because im frm pure student,,and very worry about demand of working n..i did know whether i can succeed in this course,,,please help me..
Computer Aided Design/Computer Aided Manufacturing(CAD/CAM) Engineering is only offered in University of Malaya (UM) in the engineering faculty. Same as other engineering courses, CAD/CAM engineering is a four-year course (eight semesters) with two-month industrial training at the end of third year. The course aims to produce graduates with both engineering knowledge and design skills. Computer Aided Design (CAD) is on using computer to design while Computer Aided Manufacturing is on using computer technology to manufacture industry products. Students in this course will use computer to carry out certain engineering experiments. Also, students will pick up some industrial management skills. Upon graduation, graduates from this course can register at Boards of Engineers Malaysia (BEM) and work as CAD/CAM engineers. hye... is it really demanding for mechanical course now in malaysia?? can i really have job for my future... frankly,, im not quite like with math but i love physic an bio.. to obey what i like in physic,,so i chose mechanical engineering and now im am part 1 student in local university. can someone tell me what is the best for my future in mechanical domain.. what do you think about biomedical engineering??? hey,could u give me informations about marine engineering coz i really do not know about it and whether it is one of demanding jobs in malaysia? Hi. I am interested in taking up Chemical Engineering in the future. I have read up some information about chemical engineering regarding the job prospects and other things. However most of the job prospects/ salary analysis is based on US/ UK . i have yet to read any that is based on Malaysia. Is Chemical engineering considered as a job that is on demand in Maaysia's job markets? I am very worried that i would not be able to find any good jobs in malaysia upon graduation. Thank You. can anyone suggest to me where can i study genetic engineering in malaysia? if a female take chemical engineering course, will she have a good job in future as the male? can anyone tell me which university or college has course of the chemical engineering???? what is the difference between 'civil engineering' and ' technology of civil engineering'? hye i need some help here .i am a girl and what kind of engineering courses suitable for me ?aerospace/aircraft engineering sounds interesting to me but im still think about it .someone pls help me . . I'm a foundation student in MMU currently even though i had finished my STPM.I have choose engineering as my course.Any suggestion for me?I'm quite intrest in inventing new things.What course should I take during degree?